The Thinking Processes (TP) were designed by Dr. Goldratt to help people to think better, faster and develop seemingly “impossible” solutions to their problems in a repeatable and reliable manner. They do so by enabling the correct verbalization, in a precisely defined linguistic context, of the “assumptions” we make about the situation we are analyzing. These assumptions, generally speaking, reflect mental models and limiting beliefs that “constrain” our mind in the search for a solution. Second, we concentrate on those between B-D and C-D’ hence ensuring the “reality” of the conflict. 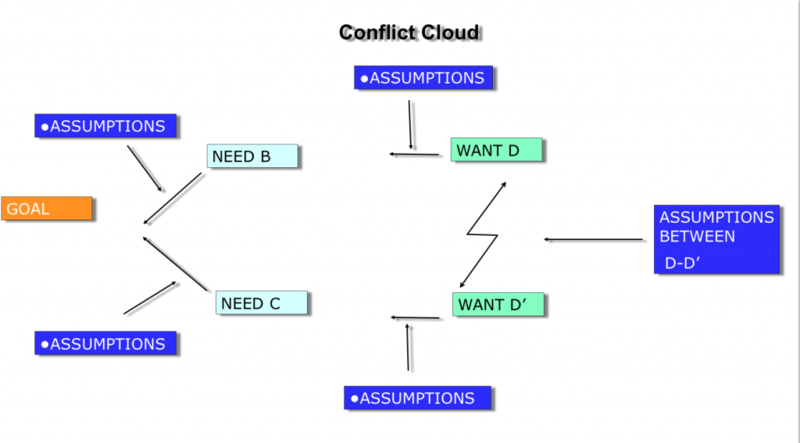 Third, we focus on what make us believe that D-D’ are in conflict, i.e. why we feel that D and D’ cannot coexist. Managing non-physical constraints means, in essence, coming to term with our limiting beliefs and finding a way to overcome them. In fact, unlike physical constraints (the ones defined by the lack of some sort of physical quantity – i.e. the ones we encounter in managing a production flow) to which we apply the steps of focusing (identify, exploit, subordinate), when we deal with non-physical limitations we should right away find a way to eliminate them. As Dr. Goldratt has pointed out repeatedly: “we subordinate to physical constraints but we elevate (eliminate) non-physical ones”. There are several proven solutions for the management of physical constraints; DBR and Buffer Management for production; Critical Chain for new product development and Project Management; Replenishment for distribution; these are the most well known. They are based on very solid algorithms and the TP facilitate the understanding of their logic. Even for Marketing and Sales a very powerfully engineered solution exists and it is called “External Constraint”. Adopt the Thinking Processes of TOC vs. Do not adopt the Thinking Process Tools of TOC. Interesting, eh? Going forward, this website will strive to provide examples of using the Thinking Processes and the Decalogue to address non-physical constraints. A small example can be found in the companion book to this website.